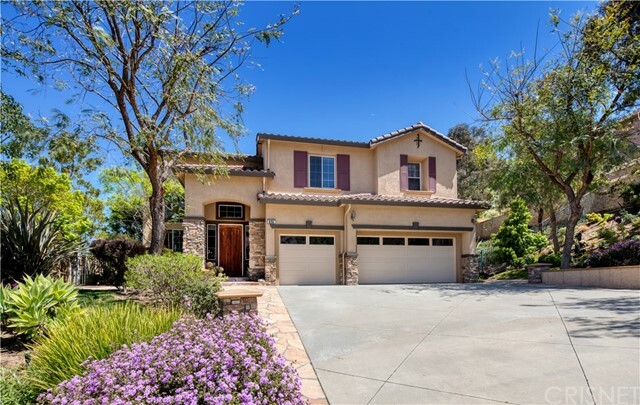 All Newbury Park homes currently listed for sale in Newbury Park as of 04/20/2019 are shown below. You can change the search criteria at any time by pressing the 'Change Search' button below. "Exclusive Paradise Estate! Serene and sophisticated living at its best, enjoy the early California style architecture, rich in features and amenities. Over 3/4 acre private lot with views, motor courtyard, casita, oversized pool, expansive outdoor kitchen and spacious detached loggia - perfect for family fun or hosting a crowd. Extensive interior remodeling throughout inc. the dine-in kitchen with Viking appliances and expanded pantry, the stone and cabinetry enhanced family room, the master suite with its own retreat and luxurious bath . . . and much more. Interior doorways have been raised to 8' to accommodate impressive, bronze enhanced thick, solid core doors. Distressed hardwood flooring, highest quality carpeting, crown and other custom moldings, plantation shutters, custom window treatments, interior and exterior SONOS audio, LED lighting, and security throughout. Also includes fully owned solar panels to power everything. Estate living at its finest - it's an absolute must see!" "Absolutely Gorgeous! Stunning Estancia in a Private Setting with Designer Inspired Upgrades & Sparkling Pool. Open and airy, filled with natural light, this house will not disappoint. Features include wood floors throughout, custom paints, shades, fixtures, hardware, and lighting. Gorgeous Kitchen Remodel with Celestial Quartz Counters, New Hardware, Subway tile backsplash, and Viking Appliances. Entertain and relax out back. Sparkling pool with water cascades, lush lawns, built-in fireplace and views towards Boney Mtn. Plan 4 features 3,978 sq ft, 5 bedrooms, 4.5 baths, and a master bedroom retreat. A master bathroom renovation is underway. Estancia is a gated community in Dos Vientos Ranch, close to miles of hiking/biking trails, the Santa Monica Mtns, with warm winds, and cool ocean breezes. With a top-rated K-8 School, and multiple parks, it's a premier destination in Ventura County." "Top of the world views on a cul-de-sac! Boney Mtn views form a backdrop whether you are seated in the spa, the pool, or the BBQ bar. Fabulous plan 4 in Serrano with close proximity to Sycamore Canyon School, Park, and Paraiso Town Center. 5 bedrooms plus master retreat, 4 baths provide room for everyone with all the upgrades. Light and Bright w/soaring ceilings, Dramatic iron staircase, Shutters, crown moldings, wood floors upstairs, upgraded tile on the first floor. Cherry kitchen cabinets, quartz counters, stainless appls and breakfast bar island. Tropical plants, fabulous views, three river flagstone pool & raised spa w/ viewing bench. A great yard to entertain, truly a house with room to fit everyone's needs! Fabulous deck off the front with views forever and huge lawn area. Paradise awaits you!" "This Deer Ridge home has been detailed for the next owner. The half-acre lot is inviting with a sport court, RV parking and amenities. The interior features a welcoming enry way and formal dining room, with a spacious family room adjacent to updated kitchen. Interior laundry room leads to 3-car garage. Master bedroom has vaulted ceilings with a balcony for enjoyment of the summer night air and view of the grounds. Pool and spa compliment a great entertainment area. Two bedrooms upstairs make for an interesting arrangment for guests. Master bath is stunning with soaking tub, dual vanity and walk-in closets. One bedroom and full bath are downstairs. There is a combination of wood floors, carpeting and tile. Kitchen is beautifully done with built-in microwave and gas cooktop,. Granite top island is ideal for crowd-sized entertaining when guest congregate in the kitchen." "No expense spared on this incredible custom modern remodeled single story pool home. Completely designed and flawlessly executed modern elegant remodel by one of Conejo Valleys most prestigious designer/builders. Every detail was carefully considered from the automatic shades and multi color LED fireplace. The quality and design is something you must see to appreciate. Home features an oversize kitchen with built in refrigerator, wine fridge and professional cooking appliances. This wrap around floorplan features a large enclosed central courtyard with builtin outdoor fireplace and sitting areas. This masterpiece of a home must be seen!" "Great executive style living in Dos Vientos. This estate set in the backdrop of rolling hills and open space, is perfect for the family entertainers. Privacy abounds on Via Vista in Newbury Park. A perfect outdoor setting consists of salt water pool/oversize spa w/waterfalls. Outdoor barbecue pavilion & pool house complete w/bath/shower. Outdoor kitchen w/stainless barbecue & tiled countertop bar. There are heaters & fan as well as wired for entertainment system. Ample Storage closets/cabinets & room for refrig. Complete this area. The interior features a kitchen that opens to the family room w/gas fireplace and view of the back yard. In addition, the 200 bottle plus wine cellar built in, is climate controlled. The formal dining room is ample size and has a glass door to the outside patio. Also, this home features a bedroom downstairs with ensuite bath and sitting room. Upstairs there are 3 additional bedrooms, a full bath and master suite. Additionally, the downstair features a dedicated office and interior spacious laundry room. 3 car garage has lots of built-in storage cabinets, work bench and is also a very functional part of this great house. Life in DV doesn't get any better. Come see this great listing." "Charm, comfort, and style have come to Dos Vientos! This beautiful single-story home is highly-upgraded and fashionable. The kitchen has been recreated with custom cabinetry and countertops along with a Viking cooktop & double ovens, and a new stainless refrigerator. Beautiful stone floors and designer light fixtures set this home apart. The home offers a lovely and peaceful rear patio and garden that is just beginning to bloom for Spring. The pergolas are adorned with strung lights and wisteria that create an enchanting space to entertain. Upgrades include a remodeled spa-like master bath and beautiful handcrafted built-ins in the family room and one bedroom, now a functional office. The home's setting is quiet, away from traffic, and sited on a cul-de-sac. Just outside the private, gated community sits a marvelous park and Boney Mountain hiking trails." "This fabulous, updated Dos Vientos home features a large downstairs master suite with direct access to the private back yard. Also on the first floor of this warm and inviting home, a large gourmet kitchen with granite counters, breakfast bar and eat-in kitchen, walk in pantry and a butlers pantry. Directly off the kitchen is the family room with fireplace, formal dining and living rooms and private separate office. Upstairs has a terrific layout with Jack and Jill bedrooms and an additional bedroom and bath each with walk-in closets. There is also a large loft, laundry room and tons of built-in cabinets. Sitting on a private lot at the end of quiet cul-de-sac, you can take in the gorgeous views of Boney Mountain from the large front porch. The back yard is a private oasis perfect for entertaining which features an oversized natural rock Spool and waterfall, a built-in BBQ area, lush landscape and a hillside that backs up to nature. Enjoy picking fresh fruit from the many variety of citrus and avocado trees that are planted throughout the hillside. Walk to hiking trails, bicycle trails are a short ride away and close to the town center and school." 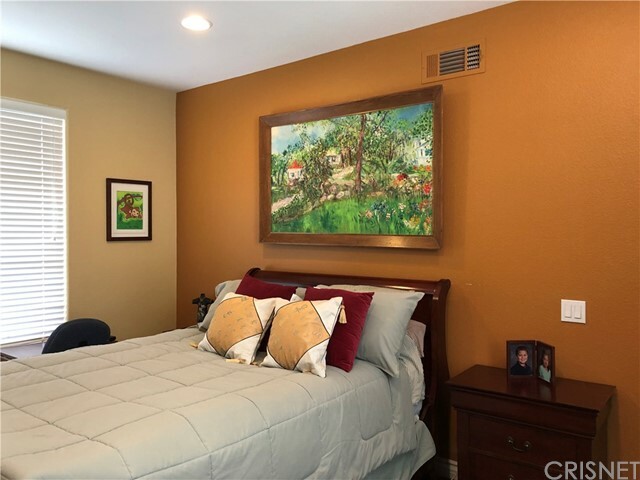 "THIS DOS VIENTOS HOME IS LOCATED ON A SMALL CUL DE SAC STREET SURROUNDED BY NATURE. THIS UPGRADED HOME HAS AN OPEN & SPACIOUS FLOORPLAN FILLED WITH NATURAL LIGHT FROM AN ABUNDANCE OF WINDOWS. THE FORMAL LIVING & DINING ROOM HAVE CATHEDRAL CEILINGS & FRENCH DOORS THAT OPEN TO THE SPACIOUS SIDE YARD. FIRST FLOOR MASTER BEDROOM WITH SLIDING DOORS TO THE SERENE BACKYARD WITH NATURE VIEWS. DUAL SINKS, SPA TUB & SEPARATE OVERSIZED SHOWER COMPLETE THE MASTER BATH. UPSTAIRS HAS THREE BEDROOMS WITH WALK IN CLOSETS PLUS EXTRA-LARGE BONUS ROOM THAT COULD BE ANOTHER BEDROOM OR LIVING/ PLAY ROOM. LARGE ATTIC SPACE UPSTAIRS FOR MORE STORAGE. AN ELEGANT & WELL DESIGNED KITCHEN HAS A LARGE ISLAND WITH SINK, SEATING WITH BARSTOOLS, MARBLE COUNTERS & BACKSPLASH, CUSTOM CABINETS, & TOP OF THE LINE STAINLESS STEEL APPLIANCES INCLUDING 6 BURNER STOVE. KITCHEN OPENS TO THE FAMILY ROOM WITH COZY FIREPLACE. OUTSIDE THE LANDSCAPED & WELL DESIGNED BACKYARD HAS A BBQ AREA, SINK, FIREPLACE, & REFRIGERATOR. PLENTY OF ROOM TO ROAM & ENTERTAIN! BRING THE OUTDOORS IN TO ENJOY THE SO CAL LIFESTYLE. SURROUNDED BY NATURAL OPEN SPACE. UPGRADES INCLUDING INCH HARDWOOD FLOORING, PLUSH CARPETING UPSTAIRS, NEW HVAC, & WATER HEATER. LOCATED TO AWARD WINNING SCHOOLS, COMMUNITY PARK, HIKING TRAILS, HORSE TRAILS & STABLES & EASY DRIVE TO MALIBU. A TRUE MUST SEE PROPERTY!" 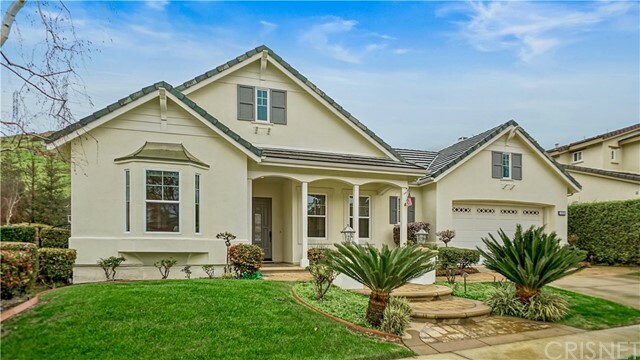 "Located in a small enclave of custom homes on a quiet cul-de-sac in Thousand Oaks, this thoughtfully designed single-story home exemplifies the Southern California lifestyle. Constructed in 1994 this contemporary home has an open floor plan with high ceilings and recessed lighting. The kitchen features stainless steel appliances, stone counters, vegetable sink, generous counter-space and seating at the peninsula. The kitchen adjoins the large family room which features a fireplace, built-in storage and a workstation. The sun-drenched breakfast room has views to the West and opens to the large patio. The master bath has been stylishly redesigned to include a massive walk-in stone shower, soaking tub, double vanity on a care-free polished concrete floor. The Master suite features a coffered ceiling, private fireplace and ample closet space. The 3 additional bedrooms suites and baths have been updated as well. The spacious laundry room includes a laundry sink and lots of storage. The large private backyard features beautiful views, a Pebble Tec pool, built-in BBQ, fire pit and lots of grass for the kids. Your dogs will enjoy the massive run on the side yard. No projects here... just unpack your toothbrush and enjoy." 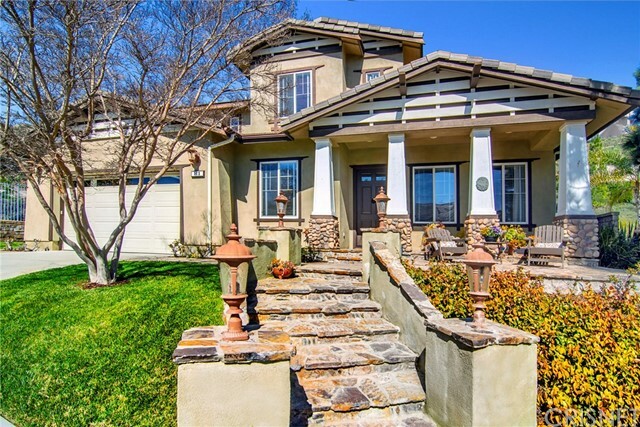 "Welcome home to Via Ricardo in Dos Vientos! Overy 3000 square feet of living space, located on a very rare and private, almost 1/2 acre of land that backs to open space! Extra long driveway and turn-about. Formal dining and living room with fireplace and hardwood floors. 2 story high ceilings, fan and fireplace in the great room with tile floors throughout, flooded with light. Gourmet kitchen features granite counters, stainless steel appliances, center island with stainless sink, lots of cabinet storage, breakfast bar seating and breakfast area. The first floor Jr. Suite has a full bathroom and sliding door to the yard. Upstairs, the large master suite overlooks the yard and open space behind. The spacious master bath features dual sinks, soaking tub, large tile shower, tile floors and walk in closet. Two additional bedrooms plus full hall bath. Spacious laundry room upstairs. The epitome of privacy and tranquility. Dos Vientos living just steps to open space, trails, shopping and the California Distinguished Sycamore Canyon School." "WELCOME to an Amazing Home located at the end of a cul-de-sac that backs to open space with STUNNING VIEWS of the surrounding mountains! As you enter you will feel the privacy this home has to offer & the openness of the living space, with an easy flow from room to room. The formal entry with beautiful marble floors opens up to the dramatic circular stairway & high 2-story ceilings. Formal living room features many windows, custom drapes & a dining room with modern chandelier. Large kitchen offers the marble floor, kitchen island, breakfast bar, recessed lighting, under cabinet lighting & a large kitchen dining area with bay windows overlooking the beautiful mountains. Family room is open to the kitchen & includes wood floors & a striking marble fireplace with glass doors & ceramic logs. Downstairs bedroom, powder room, laundry room & much more! Master bedroom suite boasts a sitting area with bay windows, wood floors & an en suite master bath with separate vanities, a make-up vanity, 2 master closets (1 is huge) with built-ins, spa tub & large shower with a shower seat & glass doors. The entertainer's backyard has a large stained concrete patio & backs only to wide open space/nature!" "Beautiful Home, Newly Built in 2006 in the Guard Gated Community of Rancho Conejo! Open Floor Plan, Over 3,600 sq. ft. with 4 Bedrooms, 5 Baths & Bonus Room. Cathedral Ceilings Throughout, Gorgeous Wood and Travertine Floors, Plantation Shutters, Crown Molding, Recessed Lighting, Surround Sound. Spacious Living Room and Dining Room. Downstairs Bedroom and Bath. Separate Powder Room. Chef's Gourmet Kitchen with Granite Counters, Stainless Steel Appliances, Built-in Frig, Big Island with Sink, Butlers Pantry, Eating Area, Adjoins Family Room with Stone Fireplace, Built-in Media Center. Wrought Iron Railing on Stairs Leads to Master Suite with Balcony and Views, Big Walk-in Closet, Luxurious Bath with Stone Tile Flooring inlays, Soaking Tub & Shower, Dual Vanities. 2 Additional Large Bedrooms and Full Baths, Huge Bonus Room, Upstairs Laundry. Yard with Lush Landscaping, Patio with Stamped Concrete and Stone Accents. Wonderful Curb Appeal, Driveway with Pavers. 3 Car Garage with Direct Access. Close to Shopping, Restaurants, Blue Ribbon Schools. Incredible Home!" "Stunning one story Concerto home in the wonderful community of Dos Vientos. With over three thousand square feet, this home has three bedrooms and and office/craft room that could be converted to a forth bedroom. The large master bedroom boasts a gorgeous master bathroom and walk in closet. Beautiful travertine tiles greet you upon entering and throughout this lovely home. The large kitchen has an eat in area, stainless steel appliances, granite countertops and a gorgeous custom range hood. The kitchen opens up to the family room. In the center of the home is a wonderful patio that not only lets tons of natural light in the home but is great for entertaining. The very private backyard backs up to a hillside so there are no rear neighbors. The home has many hiking and bike trails nearby for you to enjoy the wonderful outdoors as well as park to enjoy. This lovely home is a must see!" "WOW---GREAT PRICE!!! 4,553 SQUARE FOOT VIEW HOME WITH GUEST APARTMENT/RENTAL UNIT!!! Enjoy panoramic views of the Conejo Valley and Fireworks Hill from this gorgeous 2006-built 5 bedroom, 5 bath home. Featuring 10 foot ceilings, travertine tile and modern amenities, the main house has 4 spacious bedrooms with 4 baths and three balconies - ALL with spectacular views. Guest/rental apartment features separate bedroom and living areas. Perfect for extended family, tenant, music studio, home office, etc. Chef's kitchen with granite counters and a spacious pantry opens to the family room and separate breakfast and dining areas. When you aren't enjoying the views from the expansive deck, you can relax in the family room where you can cozy around the fireplace. The master bedroom is designed for romance with its own fireplace and private balcony for quiet evenings. The elegant master bathroom features separate tub and shower with panoramic views of the Conejo Valley. Three spacious secondary bedrooms. A bonus room provides plenty of space for games, exercise equipment, etc. With almost 20,000 sq.ft. in the two parcels, an outdoor fire pit, fenced dog run, & 3-car garage this home has everything you'll want or need. Come see it - Come home." "The home exudes pride in ownership, located in family-friendly community of Newbury Park. Behind private gate and situated at the end of a cul-de-sac this property offers 5 bedrooms/ 4 baths, over 3800 sq. ft. of living space on a spacious 11,724 sq. ft. Lot. Newly updated baths, open floor plan, incredible outdoor living space for entertaining. Plenty of room for pool and/or grassy area. Short distance to shopping, dining, and top rated schools. Best value in Conejo Valley. Backs to open space so it's completely private. Best price per square feet in town." "The most desired floorplan in Concerto at Dos Vientos. 5 bedrooms 4.5 baths. Huge en-suite bedroom downstairs, perfect for guests or an in-law suite. 4 bedrooms upstairs centered around a spacious, open, bonus room with balcony. It makes a perfect media room, playroom or office. Unusually high ceilings, & neutral decor make this home bright & airy. Living room has vaulted ceilings & fireplace, very large dining room. The kitchen with granite counters overlooks rear yard, has an eating area, opens to extremely large family room with fireplace, & entertainment niche. In addition to the upstairs bonus room there are 3 spacious secondary bedrooms. Luxurious master spans the rear of the home & has coffered ceilings & beautiful bath with large soaking tub, his & hers vanities, separate shower & large walk in closet. Entire home has surround sound including living, dining & family rooms, rear yard, master bed & bath, bonus room, front bedroom and even the garage! Dual zone heat & air, ceiling fans in family & bonus room & every bedroom. 3 car garages, laundry room with storage. Rear yard backs open space & is private & serene. Very close to the park with playgrounds & community center offering classes & activities. Minutes from award winning K thru 8 school." "Incredible single story with a Casita which adds privacy to a guest or loved one. The gate in front and the angle of the home lends itself to complete privacy. This home has a large, very unusual for the area private lot which adds to the privacy and beauty of this home. This home has a lot of special features such as the Rainbird ESP-SMT smart timer which allows the sprinklers to go on when needed only. The kitchen has the most amazing back splash and the island is large with room for a sitting area. The six burner Viking stove and the large French door Viking oven adds to the delight of any one who loves to cook. The kitchen also has a butlers pantry. There is a set up for a sound system and the home has an alarm system. The foundation is a post tension slab and the yard is large and beautifully landscaped with a nice close in patio. The patio cover has many pull down shades if needed. There is a nice lawn area for those special pets and the privacy of the yard all around is wonderful! The retractable screens allow for air to circulate and custom Travertine flooring throughout and open floor plan just adds to this home's splendor." "Welcome to Guard Gated Rancho Conejo! This 3100+ sf Shapell home is extra light & bright! Soaring ceilings & a sweeping staircase greet you as you step through the double door entry & experience living & dining rooms. The beautifully upgraded granite kitchen includes stainless appliances, a gorgeous inlaid chocolate marble & stone custom backsplash as well as expertly refinished maple cabinets done in an espresso finish...beautiful! Adjacent to the kitchen is the extra roomy family room with fireplace & ez access to the charming, private back yard with patio, fruit trees & lush landscaping. Also downstairs you will see a bedroom & wonderfully upgraded guest bath complete with a stall shower & a one-of-a-kind sink! As you meander upstairs, you will experience a GIANT BONUS ROOM, 2 nice sized guest bedrooms, a guest bath & of course, the Elegant Master Suite! The recently remodeled Master Bath has been completely reimagined to remind you of your favorite spa with an oversized steam shower, a spa tub, floating dark cabinets with extra storage, tasteful neutral quartz counters, 2 sinks, & Italian tile flooring with an accent wall, of course! Downstairs Laundry. Tankless WH. 3 Car Garage. Close to Blue Ribbon Schools, Shopping & Restaurants! Come take a look!" "Welcome to Guard Gated Rancho Conejo! This wonderful home is comprised of 4 Bedrooms, 3 Baths, and a VERY LARGE BONUS ROOM! Beautiful, from the moment you walk in, you will see the living and dining rooms, soaring ceilings, a dramatic staircase and a super sunny kitchen with white cabinets, black appliances and is adjacent to the family room with fireplace - perfect for gatherings with friends and family! The bedroom downstairs would also make a perfect office/den! Upstairs you will see two nice sized guest bedrooms, a guest bath, a VERY LARGE BONUS ROOM that has been thoughtfully separated, creating a separate sleeping area combined with a living space that includes a fireplace...so cozy! Completing the upstairs is the serene Master Suite! Gleaming hardwood floors greet you as you enter the space. It has 2 closets, a wonderful Master Bath with two separate sinks, a jetted tub and master shower - divine! In the private backyard you will notice 2 patios, a large grassy area and lush landscaping. Freshly painted interior and new neutral flooring and carpet! Interior Laundry. Three Car Garage. Close to Blue Ribbon Schools, Great Restaurants and Shopping. Come take a look!" "Gorgeous Executive home in Newbury Park featuring 5 bedrooms & 3 bathrooms, approx. 3242 sq ft with high ceilings lots of Windows to bring in all the natural lighting! Elegant living room has hardwood floors, stone fireplace, high ceilings & bay window with built-in window seat, separate formal dining room area perfect for entertaining, large open kitchen with hickory wood cabinetry, tons of storage space for the gourmet cook, granite counter tops & backsplash. Center island, walk-in pantry, refrigerator, convection & regular oven! A large open great room with marble fireplace off the kitchen for special occasions & family gatherings with French doors that open to your backyard with covered patio, colorful plants & in-ground pool & spa! 3 nice size bedrooms upstairs plus the Master suite with fireplace, sitting area, large master bath & separate shower, dual sinks & walk-in closet! 1 bed & bath are downstairs with custom built-ins plus Dual zone heating & air conditioning, double planed windows, designer light fixtures, recesses lighting, mirrored closet doors, 3 fireplaces, 3 car garage, no HOA's, located on a small cul de sac & in the Top rated school district plus close to parks, hiking trails, shopping, fine dining & more makes this home a must see!" "Gorgeous 5 Bedroom, 4 Bath Home in Cielo Real with Views! Inviting Large Courtyard with Stamped Concrete/Stone, Lighting & Tranquil Fountain. Rotunda Entry with Soaring Ceilings Leads to Living Room & Formal Dining Room. Popular Floor Plan with New Exterior and Interior Designer Paint, New Dual AC Units & Water Heater, LED Recessed Lighting with Dimmers, New Plush Carpet and Upgraded Tile Floors. Gourmet Kitchen with Center Island, Granite Counters, Stainless Appliances, Pantry and Breakfast Nook with French Doors to Lush, Nicely Landscaped Yard with Large Patio, Big Grassy Area, Big Side Yards with Fruit Trees, Plumbed for Pool with Plans. Spacious Family Room with Stone Fireplace, TV Wall Mount & Built-in Ceiling Speaker System. Downstairs Bedroom and Bath, Loft/Alcove at Top of Stairs. Private Master Suite with His & Hers Walk-in Closets with Shelving, Luxurious Bath with Dual Vanities, Tub & Shower. Three Secondary Bedrooms with Gorgeous Mountain Views Have own Bath or Jack & Jill. Laundry Room with Sink & Storage. 3 Car Garage with Shelving. Great Location, Steps to Distinguished Sycamore Canyon K-8 School, Parks, Hiking & The Village. Great Value, Must See Home!"